Lumbar discectomy is a surgery to remove a herniated or degenerative disc in the lower spine. The incision is made posterior, through the back muscles, to remove the disc pressing on the nerve. Discectomy may be recommended if physical therapy or medication fail to relieve leg or back pain or if you have signs of nerve damage, such as weakness or loss of feeling in your legs. The surgery can be performed in an open or minimally invasive technique. Figure 1. 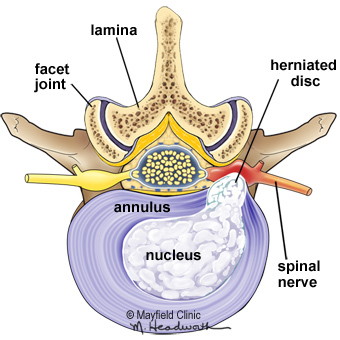 A herniated disc occurs when the gel-filled nucleus escapes through a tear in the disc annulus and compresses the spinal nerve causing pain and swelling. Discectomy literally means "cutting out the disc." A discectomy can be performed anywhere along the spine from the neck (cervical) to the low back (lumbar). 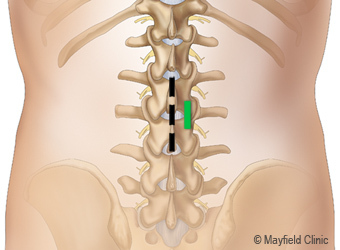 The surgeon reaches the damaged disc from the back (posterior) of the spine—through the muscles and bone. The surgeon accesses the disc by removing a portion of the lamina. 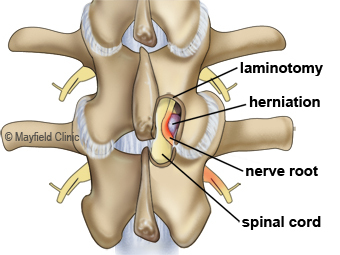 The lamina is the bone that forms the backside of the spinal canal and makes a roof over the spinal cord. Next, the spinal nerve is retracted to one side. Depending on your particular case, one disc (single-level) or more (multi-level) may be removed. A variety of surgical tools and techniques can be used to perform a discectomy. An “open” technique uses a large skin incision and muscle retraction so that the surgeon can directly view the area. A “minimally invasive” technique or a microendoscopic discectomy uses a small skin incision. A series of progressively larger tubes, called dilators, are used to tunnel through the muscles. Special instruments help the surgeon see and operate in a smaller space. A minimally invasive incision causes less disruption of the back muscles and may decrease recovery time. Your surgeon will recommend the technique most appropriate for your specific case. A fusion may be done at the same time as discectomy to help stabilize the spine for patients who are athletes, perform heavy labor, or have spinal instability. Fusion uses a combination of bone graft and hardware (screws/plates) to connect two vertebrae together. During the healing process, the two vertebrae fuse into one piece of bone. Fusion is rarely needed for a herniated lumbar disc . Bulging or herniated disc: The gel-like material within the disc can bulge or rupture through a weak area in the surrounding wall (annulus). Irritation and swelling occurs when this material squeezes out and painfully presses on a nerve (Fig. 1). Degenerative disc disease: As discs naturally wear out, bone spurs form and the facet joints inflame. The discs dry out and shrink, losing their flexibility and cushioning properties. The disc spaces get smaller. These changes lead to stenosis or disc herniation. Most herniated discs heal after a few months of nonsurgical treatment. Your doctor may recommend treatment options, but only you can decide whether surgery is right for you. Be sure to consider all the risks and benefits before making your decision. Only 10% of people with herniated disc problems have enough pain after 6 weeks of nonsurgical treatment to consider surgery. Stop taking all non-steroidal anti-inflammatory medicines (Naprosyn, Advil, Motrin, Nuprin, Aleve, etc.) and blood thinners (Coumadin, Plavix, etc.) 1 to 2 weeks before surgery as directed by the doctor. Additionally, stop smoking, chewing tobacco, and drinking alcohol 1 week before and 2 weeks after surgery because these activities can cause bleeding problems. No food or drink is permitted past midnight the night before surgery. Arrive at the hospital 2 hours before (surgery center 1 hour before) your scheduled surgery time to complete the necessary paperwork and pre-procedure work-ups. An anesthesiologist will talk with you and explain the effects of anesthesia and its risks. An intravenous (IV) line will be placed in your arm. There are five steps of the procedure. The operation generally lasts 1 to 2 hours. You will lie on your back on the operative table and be given anesthesia. Once asleep, you are rolled onto your stomach with your chest and sides supported by pillows. The area where the incision will be made is cleansed and prepped. With the aid of a fluoroscope (a special X-ray), the surgeon passes a thin needle through the skin down to the bone to locate the affected vertebra and disc. In an open discectomy, a skin incision is made down the middle of your back over the affected vertebrae (Fig. 2). The length of the incision depends on how many discectomies will be performed. A single-level incision is about 1 to 2 inches long. The back muscles are retracted on one side to expose the bony vertebra. An X-ray is taken to verify the correct vertebra. Figure 2. For an open discectomy, a 1- to 2-inch skin incision (black line) is made down the middle of your back. Muscles overlying the vertebrae are retracted to one side. For a minimally invasive discectomy, a small stab entry (green line) is made in the skin near the midline. 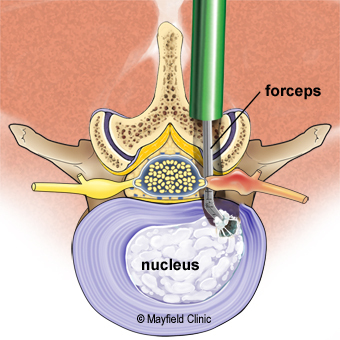 In a minimally invasive discectomy, a small incision (less than 1 inch) is made to one side of your back (Fig. 3). Next, a series of progressively larger dilators are passed, one around the other, to gradually separate the muscles and create a tunnel to the bony vertebra. Figure 3. For a minimally invasive discectomy, the muscles are dilated gradually with increasingly larger tubular retractors to gain access to the bony lamina. Next, a small opening of the lamina, above and below the spinal nerve, is made with a drill or bone-biting tools (Fig. 4). A laminotomy can be done on one (unilateral) or both (bilateral) sides, or on multiple vertebrae levels. Figure 4. A laminotomy makes a small window by removing bone of the lamina above and below. The nerve root and spinal cord can be gently reflected to expose the herniated disc. With the lamina removed, the surgeon gently retracts the protective sac of the nerve root. The surgeon looks through a surgical microscope to find the herniated disc. 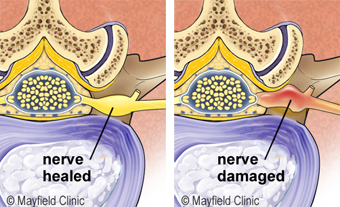 Only the ruptured portion of the disc is removed to decompress the spinal nerve root. The entire disc is not removed (Fig. 5). Bone spurs or a synovial cyst that may press on the nerve root are also removed. Figure 5. The herniated disc material compressing the nerve root is removed. For a single-level lumbar discectomy, fusion is rarely performed. However, other conditions, such as recurrent disc herniation or spinal instability, may be treated with a fusion. The retractor holding the muscles is removed. The muscle and skin incisions are sewn together with sutures or staples. Steri-Strips are placed across the incision. You will awaken in the postoperative recovery area, called the PACU. Blood pressure, heart rate, and respiration will be monitored. Any pain will be addressed. Once awake, you will be moved to a regular room where you’ll increase your activity level (sitting in a chair, walking). Most patients can go home the same day. Other patients can be released from the hospital in 1 to 2 days. Do not smoke. Smoking delays healing and inhibits bone growth. You may need help with daily activities (e.g., dressing, bathing) for the first few days. Fatigue is common. Let pain be your guide. If you have Dermabond (skin glue) covering your incision, you may shower the day after surgery. Gently wash the area daily with soap and water. Pat dry. If you have staples, steri-strips or stitches, you may shower 2 days after surgery. Remove the gauze dressing and gently wash the area with soap and water. Replace the dressing or completely remove it if no drainage. Inspect and wash the incision daily. Do not apply any lotions or ointments over the incision. Staples, steri-strips, and stitches will be removed at your follow-up appointment. Schedule a follow-up appointment with your surgeon for 2 weeks after surgery. Physical therapy may be necessary for some people. The recovery time varies from 1 to 4 weeks depending on the underlying disease treated and your general health. You may feel pain at the site of the incision. The original pain may not be completely relieved immediately after surgery. Aim to keep a positive attitude and diligently perform your physical therapy exercises if prescribed. Most people can return to work in 2 to 4 weeks or less with jobs that are not physically challenging. Others may need to wait at least 8 to 12 weeks to return to work for jobs that require heavy lifting or operating heavy machinery. People with moderate to severe pain who had surgery notice a greater improvement than those who did not have surgery. Similarly, minimally invasive discectomy techniques have been shown to be comparable in outcomes with open discectomy . While the benefits of minimally invasive approaches include shorter operative time, less blood loss and muscle trauma, and faster recovery, these newer techniques are not appropriate for all patients. Ask your surgeon if minimally invasive microendoscopic discectomy is appropriate for you. Discectomy may provide faster pain relief than nonsurgical treatment. However, it is unclear whether surgery makes a difference in what treatment may be needed later on. About 5 to 15% of patients will have a recurrent disc herniation, either at the same side or the opposite side. Deep vein thrombosis (DVT) is a potentially serious condition caused when blood clots form inside the leg veins. If the clots break free and travel to the lungs, lung collapse or even death is a risk. However, there are several ways to treat or prevent DVT. Get up and out of bed as soon as possible so your blood is moving and less likely to clot. Support hose and pulsatile stockings can keep the blood from pooling in the veins. Drugs, such as aspirin, Heparin, or Coumadin, may also be used. Lung problems. Lungs need to be working their best after surgery to provide tissues with enough oxygen to heal. If the lungs have collapsed areas, mucus and bacteria build up can lead to pneumonia. Your nurse will encourage you to breath deeply and cough often. Nerve damage or persistent pain. Any operation on the spine comes with the risk of damaging the nerves or spinal cord. Damage can cause numbness or even paralysis. However, the most common cause of persistent pain is nerve damage from the disc herniation itself. Some disc herniations may permanently damage a nerve making it unresponsive to decompressive surgery (Fig. 6). In these cases, spinal cord stimulation or other treatments may provide relief. Be sure to go into surgery with realistic expectations about your pain. Discuss your expectations with your doctor. Figure 6. Several months after surgery, the disc wall and nerve root should repair and heal. However, sometimes the nerve is unable to repair itself fully and some symptoms may persist despite removing the pressure off the nerve. This situation is similar to moving furniture off the carpet. Once the heavy couch is moved, the carpet fibers re-expand and look like new; other times the imprint is there forever. Resnick DK, et al. Guidelines for the performance of fusion procedures for degenerative disease of the lumbar spine. Part 8: lumbar fusion for disc herniation and radiculopathy. J Neurosurg Spine 2:673-78, 2005. Atlas SJ, et al. Long-term outcomes of surgical and nonsurgical management of sciatica secondary to a lumbar disc herniation: 10-year results from the Maine Lumbar Spine Study. Spine, 30(8): 927–935, 2005. Ryang YM, et al. Standard open microdiscectomy versus minimal access trocar microdiscectomy: results of a prospective randomized study. Neurosurgery 62:174-81, 2008.
herniated disc: a condition in which disc material protrudes through the disc wall and irritates surrounding nerves causing pain. We perform about 1,700 lumbar discectomy surgeries in a typical year. 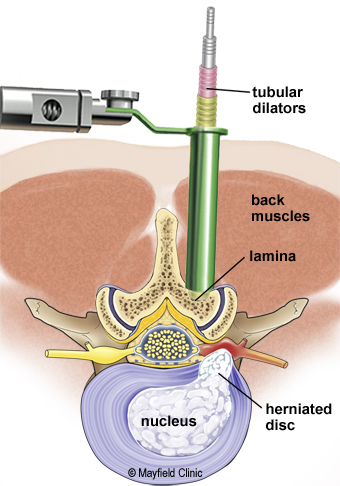 Whenever possible, discectomy procedures are performed with minimally invasive techniques. About half include a spinal fusion.